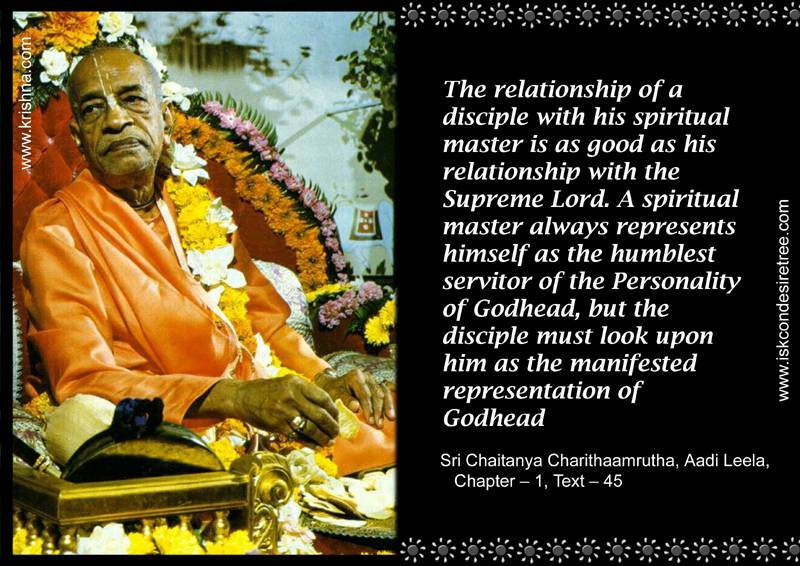 The relationship of a disciple with his spiritual master is as good as his relationship with the Supreme Lord. A Spiritual master always represents himself as the humblest servitor of the humblest servitor of the Personality of Godhead, but the disciple must look upon him as the manifested representation of Godhead. — Sri Caitanya Caritamrita, Adi Lila, 01.45. Guru is pleased when he sees that the disciple is showing the symptoms of Shudh Bhakti. A general instruction of the spiritual master becomes a personal and specific instruction for a sincere disciple. One must accept the words of an Acharya, a bona fide spiritual master, to clear the path for spiritual advancement. This is the secret of success. However, one’s guide must be a spiritual master who is actually an unalloyed devotee strictly following the instructions of the previous acharya without deviation. Whatever the spiritual master says must be accepted by the disciple. Only then is success certain. This is Vedic system. Sincerity in sadhana and eagerness to serve is the basis of one’s relationship with the spiritual master. Disciple should get all the treasure what Guru has got.